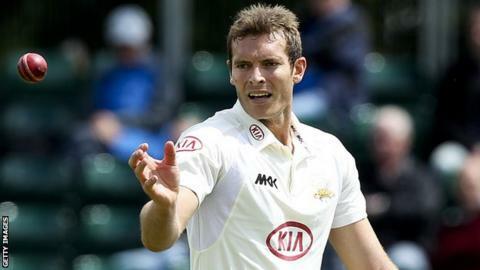 Surrey fast bowler Chris Tremlett says he is making good progress after an injury-ravaged 2012 season. The 31-year-old was restricted to just seven county appearances last year because of back and a knee problems. He told BBC London 94.9: "It's been going really well and the last month or so we have been in the indoor school stepping it up each week. "In the last three weeks I've not been far off sending it down at 100 per cent, although it is a shorter run-in." Tremlett underwent back surgery in February last year after a bulging disc ended his involvement in the Test series against Pakistan and forced him out of England's Test series with Sri Lanka. The former Hampshire man, who has played 11 Test matches and 15 ODIs, returned to county action in June but only played six T20 matches and one County Championship game. He had an operation to repair torn knee cartilage in September and signed a new one-year deal with Surrey later that month. But Tremlett says he is in better shape at this moment in time than he was last season. "I had stages last year where I came back and I didn't feel 100 per cent," he added. "I wasn't far off and got back to playing but I never felt totally fit. "I can say at the moment that my body feels normal, which is a very nice feeling. "It's nice to be able to run in the nets pretty much three or four days a week, not be in pain and work on those things which I'd forgotten really because it had been such a long time since I'd played. "It is still only still February and a couple of months before the first proper game. "It's about not getting too giddy. We are still working at a certain intensity and [fast bowling coach] Stuart Barnes has got a speed gun we are working with and he is monitoring that. "It's nice to get going again and hopefully I can continue that progression and hopefully the injuries will stay away this time." Tremlett is set to fly to South Africa to continue his rehabilitation under the supervision of England and Wales Cricket Board coaches at a camp for young cricketers with potential for the future. "It's a great opportunity which the ECB have given me to go over there," he said. "I went over there last year for two weeks and it is good progression to get outside and add the intensity to my bowling. "It is a great opportunity to get outside, put a spike on my foot, take it to the next level and gain that confidence. "I might even have the chance to play in a game over there. That's the next stage. "Hopefully I'll come back at the start of March and be fully fit with some decent overs under my belt. "It has all come around very quickly but I am in a good place at the moment."